One my first essays on food was about my mother-in-law, who welcomed me to my husband’s home in Trinidad with curried armadillo, a local delicacy. This was an appropriate beginning to a relationship centered in the kitchen. We both love the kitchen and are both capable of letting the hours pass us by as we cook for our family in the kitchen. Just not at the same time. (I think there must be at least one other mother-in-law/daughter-in-law pair out there familiar with the scenario of too many cooks in the kitchen.) I’ve told my husband, with only the slightest hint of exaggeration, that no kitchen would be big enough his mother and me to cook together. More politely, I urge my mother-in-law, who we call “Mommy,” to take it easy, she is my guest, let me do the cooking this time. A lot of that has to do with my difficulty handling play-by-play correction/advice (“Not like that, like this!”). But we also have two different cooking styles. I do enjoy experimenting in the kitchen, but I am also a fan of trying new recipes. My mother-in-law, I thought until recently, never used recipes, being instead the kind of intuitive cook that most of our mothers and grandmothers are. Well, the things you don’t know about people! After nearly twenty years of cooking in parallel, if not collaboratively, I learned, while chatting over the appearance of a boiled Hainanese style chicken, that my mother-in-law sometimes uses recipes. “They said to add one cup of water,” was the revelation that cast her in a whole new light. “Who said?” I queried. “The newspaper,” came the surprising response. Now, it seemed, I could learn to cook from her. 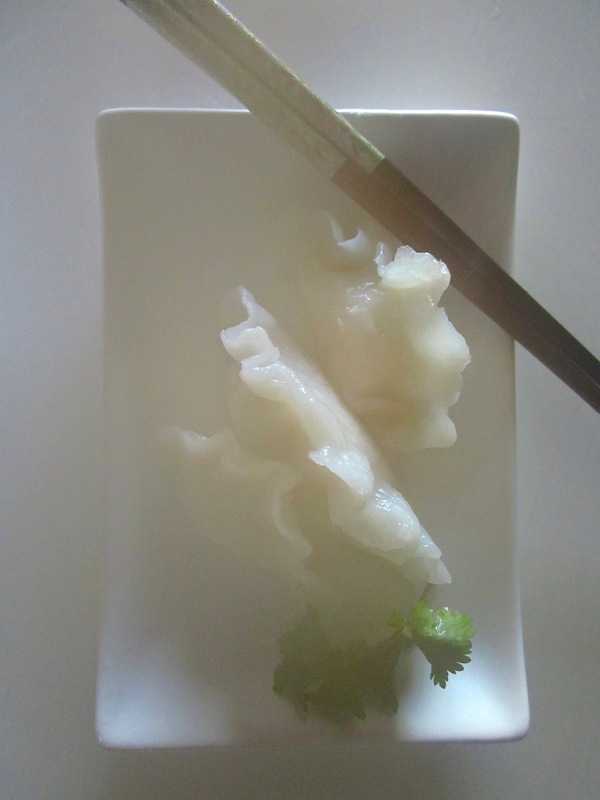 “Mommy,” I asked tentatively, “Can you teach me how to make har gao?” For those of you unfamiliar with the name, you’ve likely tasted these translucent and lovely shrimp dumplings if you’ve ever had dim sum. Chinese New Year is on Monday 1/23/12, when we’ll usher in the Year of the Dragon. By now, Chinese households are traditionally given a thorough cleaning, new clothes are bought for new beginnings, and preparations are underway to prepare a special meal of symbolic foods to be eaten on the eve of the new year. Dumplings, whose shape resemble gold ingots, are traditionally made on the new year for prosperity. I usually make pork-filled dumplings in prepared potsticker wrappers, but I thought I try something new this time. 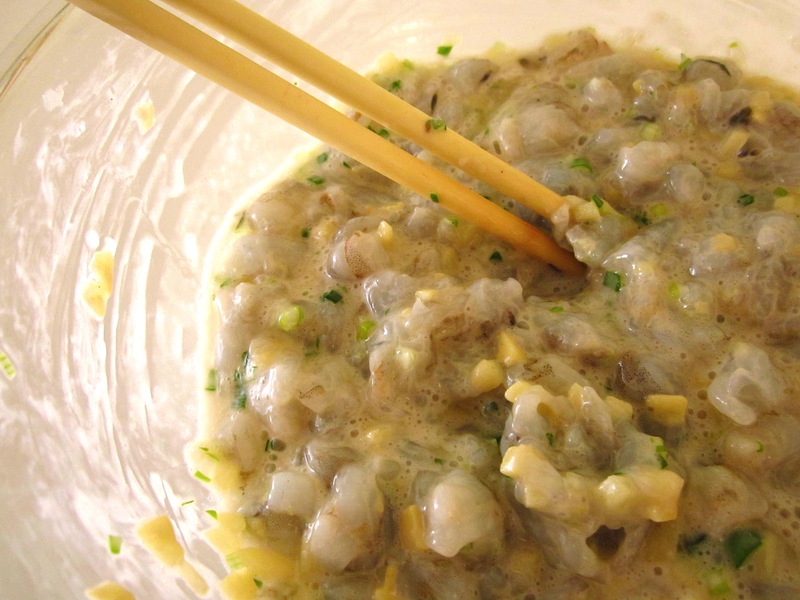 In addition to the good luck associated with dumplings, shrimp is associated with joy and laughter. New year, new beginnings, and a new start in the kitchen with my mother-in-law, who shared with me her recipe for har gao. Gung hay fat choy! Making the dough to wrap these dumplings is tricky. Instructions are sufficient as a start, but only side-by-side coaching and practice can perfect this skill. Boiling hot water is used to make the dough, which requires fast moving and teflon-coated hands. After the torturous kneading, make sure to keep the dough covered with plastic wrap or a moist cloth at all times because it dries out fast. It’s also a particularly sticky dough, so I recommend keeping your work surface and hands lightly oiled. Finally, the dough is delicate, so it needs to be rolled thin enough to be attractive, but thick enough to prevent breakage. Heed these warnings and you’ll create some lovely, love-filled dumplings. These make a great, light meal served with a soy based or chilli dipping sauce and some stir-fried Chinese greens. Filling recipe is adapted from Chinesefood.about.com. 1. Make the filling first so the flavors can meld. Combine all ingredients in a bowl and stir well. Store tightly covered in refrigerator until ready to wrap dumplings. 2. In another bowl, sift together the starches and salt. Bring 3 cups water to a boil and pour immediately into the starch mixture, stirring immediately with a spoon. Add oil and stir, then knead into a dough with your hands (carefully, it’s hot!) until you have a ball of dough. Cover with plastic wrap or a damp cloth and let rest for 20 minutes. 4. 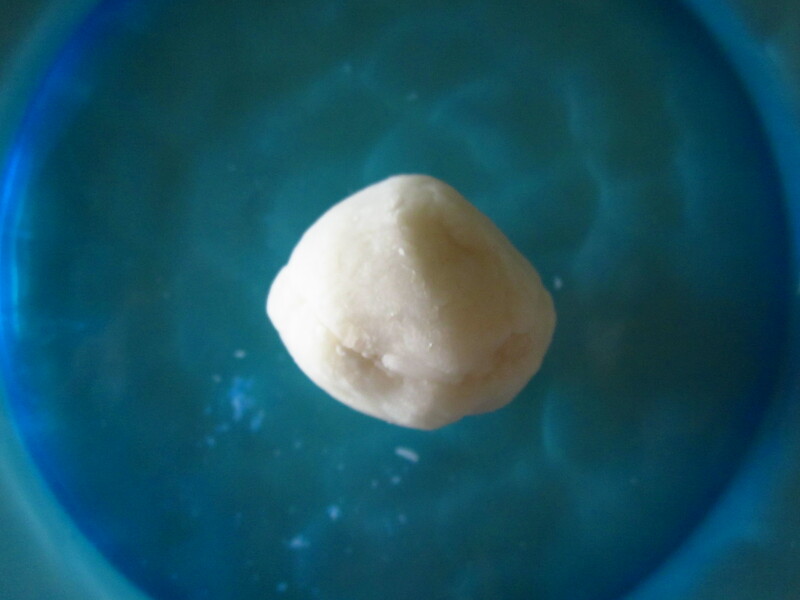 Prepare individual dumplings by pinching off about an inch of dough, rolling into a ball, then pressing in to a flat, even circle about 2-1/2 to 3 inches in diameter (same as a prepared potsitcker wrapper). 5. After making your dough circle, use a spoon to place a teaspoonful or so of filling in the center of the circle. 6. 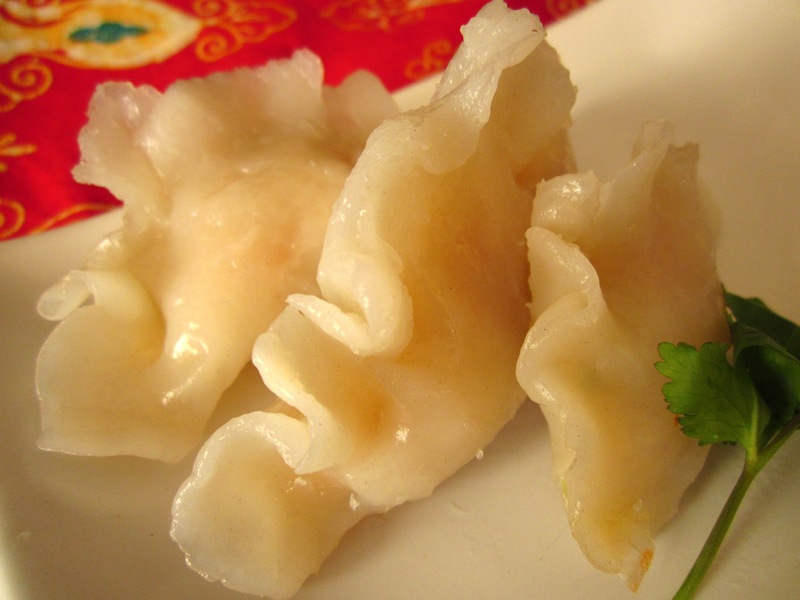 Carefully fold the dumpling in half by bringing one edge over to meet the other side and pressing the edges together. 7. 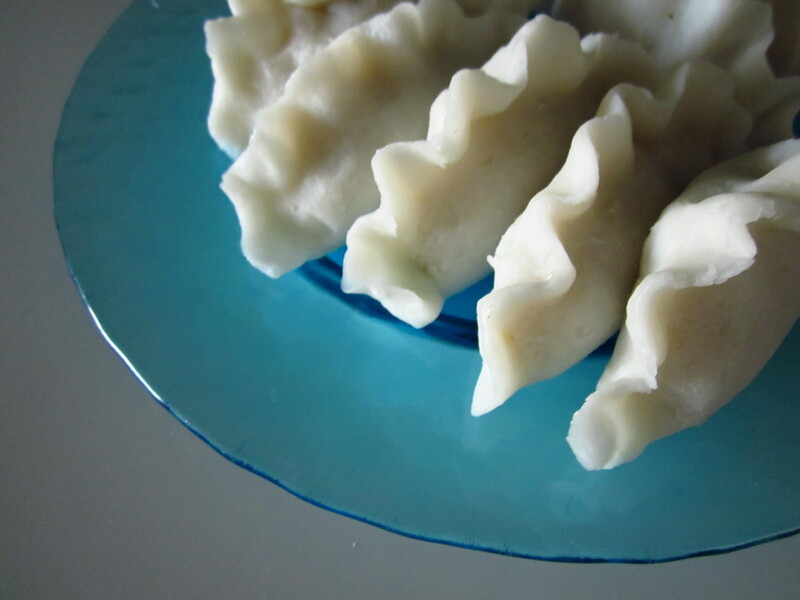 After your dumpling is sealed, use your thumb and index finger to crimp edges into pretty pleats. 8. Repeat until you have used up all of the filling. You may have extra dough left over (handy for dumpling wrapping accidents). Keep prepared dumplings covered with plastic wrap until ready to steam. 9. Prepare a steamer (available in Chinese markets and kitchenware stores). 10. When all of your dumplings have been assembled, place them in a single layer with space around each in a steamer basket lined with parchment paper (or on an oiled plate) and steam 15-20 minutes until slightly translucent and the shrimp filling is pink. Let cool for a minute before removing to a platter (if removed too soon they’ll be more likely to break). Serve with your favorite dipping sauce, such as soy sauce, vinegar, or chilli sauce. 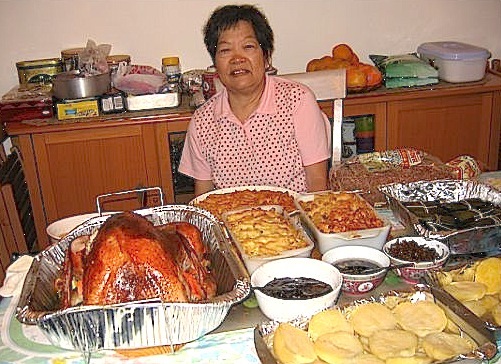 Thanksgiving 2007, Flushing NY. Mommy did all the cooking. Yum! I love Har Gao but I don’t know how to make them. Thanks for the recipe! What a delicious post!!! Thank you. It was really a lot of work (2.5 hours!) but I felt proud of myself afterwards. I’m sure it won’t take as long with more practice. I love har gao. Great photos with your recipe! I love Mommy and I definitely want a plateful of dumplings! 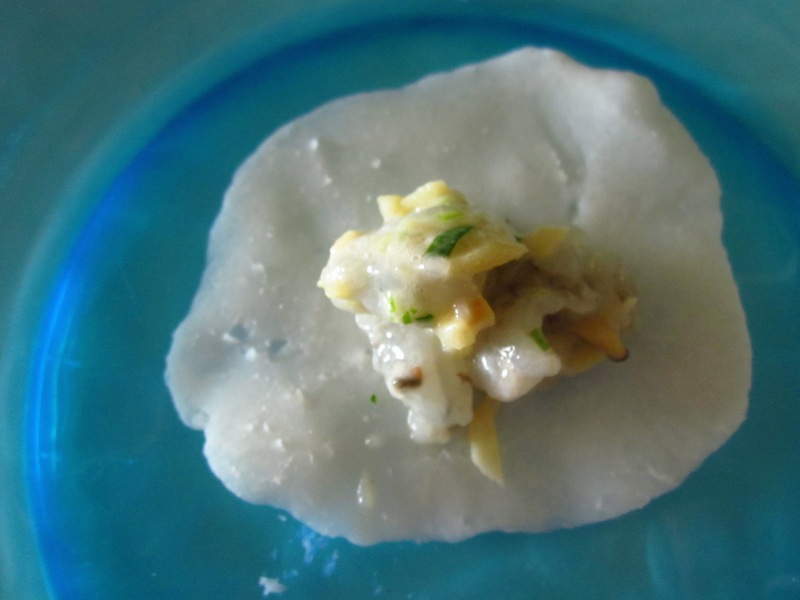 I’ve never tried making har gao – it seems like so much work – bravo! Worth the effort! Thanks for including this on your lovely Pinterest board. Thanks for including my Pineapple Tarts in your roundup! Happy Chinese New Year to you, too! You’re welcome– best way for me to have your recipe for future reference. Happy New Year! Mmmm.. I love dumplings!!! These looks so delish!! Thank you! It’s a bit tricky to master the dough and wrapping, but worth the effort.